What are the best leg exercises for knee pain? It's such a common question and over many years, working with hundreds of patients, I’ve pulled together a selection of mid-level exercises that I have found work well for all sorts of knee pain. Here you will find some of the best leg exercises incorporating strengthening, balance and stretching exercises that can help many causes of knee pain. Muscles can get weak and tight over time or after an injury without us really noticing. When this happens, it changes the way the knee moves and how the forces go through the knee which causes pain. Most causes of knee pain will benefit from knee exercises. The exercises here are mid-level exercises. If they feel too strenuous or your knee movement is quite restricted, try simpler exercises first. However if you are looking for something more challenging, visit the advanced exercises section. To get the most out of these best leg exercises, visit the top tips on exercising section before you start and always check with your doctor before starting on a new rehab program. Here you will find six of the best leg exercises for increase strength. Strengthening the leg muscles is one of the best ways to reduce most causes of knee pain. You should notice an improvement after 3-4 weeks of doing these exercises, if you do them regularly. Purpose: One of the best leg exercises for strengthening the buttock muscles. Almost everyone I've seen with knee pain has weak glutes. The glutes help support the knee and make sure the forces are evenly spread throughout the joint. Action: Slowly, step your other leg up onto the step and then lower it back down to the floor. Good balance/proprioception is really important to prevent knee injuries. As a quick test to see whether you would benefit from this exercise try standing on one leg with your eyes closed. If you can’t do it for 1 minute, you would benefit from this exercise. This is one of the most simple but best leg exercises to help your body learn the subtle adjustments needed for good balance. Tight muscles are a common cause of knee pain. If the muscles are tight, it changes the way the knee moves and alters how the forces are distributed through the knee. Here you will find the best leg exercises for stretching the quads and hamstrings as these are the most common muscles to be tight. Visit the knee stretches section for a quick test to see if your muscles are tight and you would benefit from stretches, or for different ways of stretching these muscles. You will also find the best leg exercises for stretching the glutes, ITB and calf muscles there. 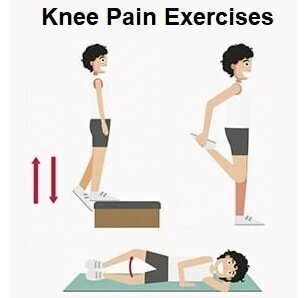 There are lots of exercises that can help knee pain. Try them out and chose the best leg exercises for you. They should be moderately challenging but not painful. See the exercise overview for tips on working at the right level for you. If these exercises feel too hard at the moment, do the beginners exercises for a few weeks, and once you have built up some more strength, come back to these intermediate best leg exercises. Once you have done these intermediate best leg exercises for a few weeks, you should have built up the number of repetitions of each exercise and they should be starting to feel quite easy. When that is the case, CONGRATULATIONS! You are ready to progress on to more advanced knee pain exercises to help build up more strength and flexibility. Remember with any knee problem, you should always see your doctor before you start exercising, but once you get the all clear, you’re ready to go with these best leg exercises for knee pain.